As a food blogger, I have a choice. I can make getting the shot and documenting the meal the priority, or I can make interacting with my guests and eating the meal the priority. Guess which way it went last night. When this mind-blowingly delicious dish first made it into the bowl, it was gorgeous. A riot of color. My friend Deb was here with kids and we had spent the early part of the evening catching up, dishing out pasta and chickpeas and carrots and hummus to our tribes while we drank white wine. On the stove, our chickpeas were bubbling away in a pot of water and the onions and (veg) sausage were in a sauté pan making us hungry with their smell. (There are few things in this world that smell better than onions sautéing, in my opinion.) The kids, having not seen each other in a long time (a month is a long time when you are seven, six, five, and four), ran downstairs to play and I put the finishing touches on our dinner. You know when you just know something is going to be good? This recipe comes from Gail Simmons’ book Talking with My Mouth Full which is a memoir with just a few recipes. I think she is very interesting and intelligent but the book just doesn’t do her justice (sorry Gail!). However, if the rest of the recipes are as good as this one, I will recommend you buy the book anyway. A quick glance at the ingredients list told me this would be a winner. 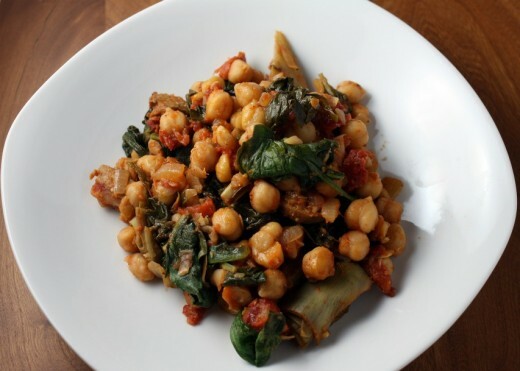 Lots of chickpeas, fresh artichokes, smoked paprika, spinach – some of my very favorite things. I have been using more vegetarian sausage products so I knew swapping the kielbasa for Tofurkey would not be a problem. I spooned us each a healthy portion and then paused. Should I take a photo? I’m hungry. Deb is waiting for me in the dining room. Where is my light? Where is my memory card? Which lens do I have on my camera? Oh, look at all that steam – hard to capture that in a photo. Screw it. I’ll take one after we are done. So this happened. A picture that does not do this dish justice. A kind of wilted flabby picture. One you might very well pass by. Don’t! This stew has such a smoky hearty flavor and so many wonderful textures that I kind of fell in love with it. I had planned to make it with frozen artichokes but then found some fresh beauties at the store and went that way instead. I hear that frozen artichokes are a pretty acceptable substitute but when fresh are available, I always buy those. I find breaking them down to be oddly meditative. I know, there is so much waste! with fresh artichokes. I’ll tell you what I tell my classes – get over it. 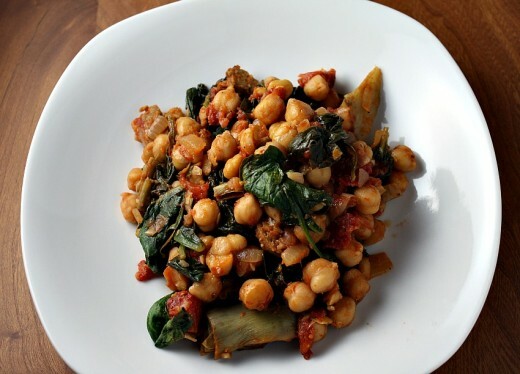 Finally, I used dried chickpeas in this dish because I really prefer them and I don’t think they take nearly as long to cook as most directions say. With even a quick soak (2 hours), they cook up nice and tender in about 45 minutes. But I’m sure canned would be fine here. Use 2 15-ounce cans. Gail says this serves 4 but it makes a HUGE amount of stew! She adds 2 cups of stock to the dish, which would probably yield even more servings, but I opted to leave it out for a less liquid-y stew. Next time I might add ½ a cup or so. In a medium saucepan, cover the chickpeas with 2 inches of water and bring to a boil. Reduce the heat to low and simmer until the chickpeas are tender 45-60 minutes. Add water as necessary to maintain level. Drain the chickpeas and set aside. Place a large heavy pot (like a Dutch oven) over medium heat. Drizzle in just enough olive oil to coat the bottom of the pot, then add the onions and a large pinch of salt. Cook until the onion begins to turn translucent, about 5 to 7 minutes, then add the garlic. Cook for another 2 minutes, then add the sausage. Continue to cook until the sausage starts to brown, about 10 minutes. Add the tomatoes with their juices and cook until sizzling, about 4 minutes. Add the artichoke hearts, smoked paprika, and bay leaf; cook for 5 minutes. Add the drained chickpeas and bring to a boil. Reduce the heat so that the stew simmers, then cover the pot and allow the artichoke hearts to cook through and the flavors to meld. Check periodically to make sure nothing is sticking and add a bit of water as necessary. When you can easily pierce an artichoke heart with a fork, remove the cover and start adding the spinach in batches. Cook until all the spinach is wilted – this will take another 5 to 7 minutes. Taste and adjust the seasoning as necessary. Wilted and flabby are descriptive words but I would like to describe it as colourful and tempting. If my mouth watering is any indication I would say that the pictures did the trick. This looks fantastic. I don’t know if I could ever pass up the combination of chick peas, tomatoes and spices. I know the photo challenge well and living in Canada means I have (lack of) light issues to deal with for more than a few months of the year. Thanks for the post and the fantastic looking chick peas!!! Mmm what a fabulous idea! Yum! 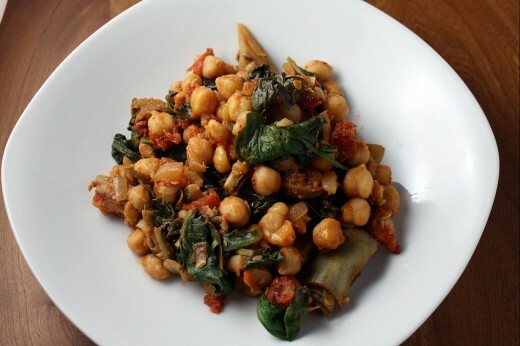 I see nothing flabby here…just a whole lot of chickpea stew deliciousness! Being single, my choice is usually never such a big deal…though I have on occasion just said screw it and those things just don’t get posted. I’m SO glad you posted this though because I already know it will be a favorite in my belly. I’ve never cooked with fresh artichokes – other than just steaming them to eat with butter and lemon. As for your photos, I see nothing wrong here! You have good light, it looks delicious, whatever works! Glad you’re back and I can’t wait to hear about your trip!